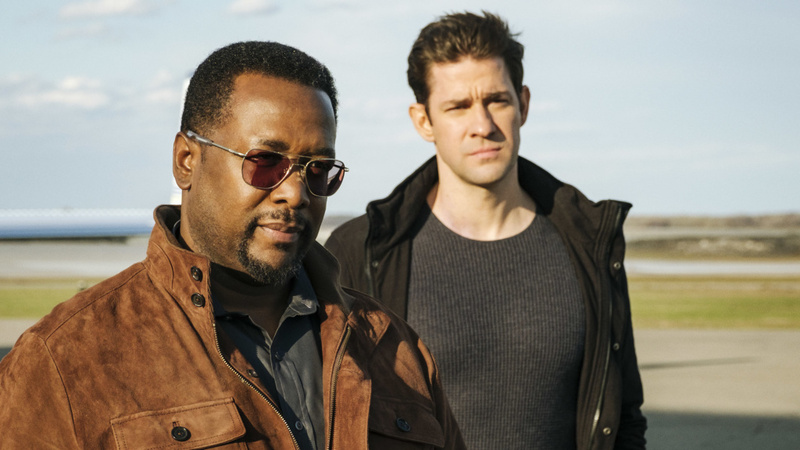 Wendell Pierce and John Krasinski in Tom Clancy's Jack Ryan. "I mean, I guess, if you want." This is the review I threatened to write on Twitter the other day for a show I didn't name that is, in fact, Jack Ryan. Officially, Tom Clancy's Jack Ryan. More specifically, Amazon's Tom Clancy's Jack Ryan. And, per some new corporate branding, Amazon's Prime Video's Tom Clancy's Jack Ryan. Ryan was created in The Hunt For Red October, a Clancy novel released in 1984. He's been at it ever since, in novels and films, and even after Clancy died in 2013 and other writers carried on the franchise. He's had a zillion jobs — even President of the United States. But in Jack Ryan the TV show, Jack Ryan (John Krasinski) is an allegedly eggheaded CIA analyst whose new boss, Jim Greer (Wendell Pierce), was recently demoted because of Issues In His Past. Ryan also has Issues In His Past, but the two of them are thrown together to face a more urgent situation: Ryan believes he's found the financial resources of a terrorist leader (Ali Suliman) who's plotting a major attack. Oh, how I wish I could tell you that this show — which has two leads who have been quite beloved on The Office and The Wire respectively — finds a way to rise above the firefights and explosions and terrorism tropes that are part of the genre. I wish I could tell you it is character-driven, that it relies on its actors to make it more than it seems like it is. But in fact, it is what it seems like it is. Men — and it is almost entirely men — have serious and important conversations in which they throw around national security lingo that you don't even need to understand, because they might as well be saying, "Something bad is happening! We cannot wait for bureaucrats! We must handle it ourselves!" Awful deaths of the innocent are used to ramp up the stakes. Jack meets a girl (and Abbie Cornish, as she's done in other roles, struggles to fix on any consistent accent), and she's in the security business, too. A troubled faraway drone pilot — similar to the troubled faraway drone pilots Hollywood has already shown us multiple times (in films including Good Kill, starring Ethan Hawke, and Eye in the Sky, starring Aaron Paul) — struggles with his responsibility for killing people at a distance. He frets and self-destructs and then starts doing things that just come off as silly. It's ... fine. If you think what television needs is more things blowing up, more people getting mowed down by guns, more tense meetings in which the smart guys who have it all figured out try to get through to people who just don't get it? Then this might be for you. It certainly benefits from Pierce especially, who can take any scene, however underwritten, and transform it into one man's battle against idiots. And while it's yet another piece of terrorism-oriented entertainment, the show tries not to lean too hard into "USA! USA!" chants: In addition to the drone pilot's woes, there are efforts to nod at the suffering of refugees, though this is just about the most circuitous route that could have been taken to get to that issue. There are also efforts to remind viewers that terrorists, too, have families and reasons why they feel as they do. Amazon expects a lot from this show: They renewed it for a second season back in April. But please know that this is not an example of streaming television taking the opportunity to expand what television looks like the way that Amazon — alongside Netflix and Hulu and others — has done in the past. This could be a CBS Wednesday night hour, except that it has more swearing and violence (and, admittedly, better-pedigreed actors) than you'd see there. So should you watch it? I mean, I guess, if you want.